The Apothecary range dates back to the original roots of Rose & Co in the humble village of Haworth, Yorkshire. With simple, original apothecary formulas and enriched with the exfoliating nature of walnut shells and refreshing Oriental fragrances blended with Rose, Lilac and Jasmine, this Rose & Co Apothecary Soap Bar has rejuvenating properties. These vegan-friendly soaps are formulated with pure vegetable oils with generous amounts of moisturizing glycerine and nourishing shea butter. 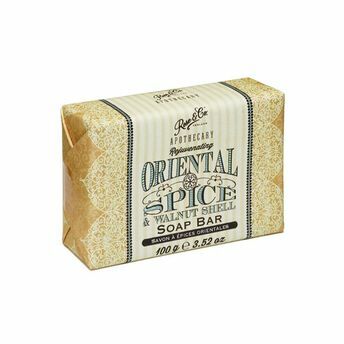 This creates a smooth, silky soap that won't dry your skin out.